The three inch oval of very delicately carved silver pearl is a work of art in itself and took Julie Warenski scads of painstakingly time so as not to rush it and break the pearl (and then start allover). 18K gold swivel lanyard and gold pins in the blade. The black lip pearl under the fretted carvings give dimension and a reflective radiance to the silver pearl. 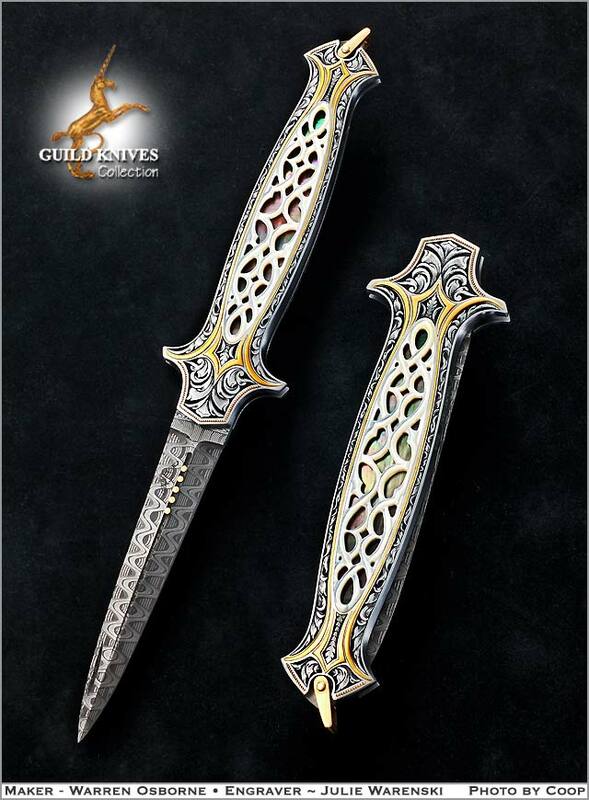 Gold inlays and engravings surround the entire handle of the fretted knife. A timeless knife of investment grade work by two top art craftsmen. Their best collaboration to date. Copiously gold engraved with double silver pearl carved ovals overlaying the blacklip pearl substrata.